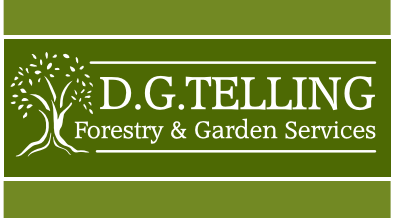 Tree stumps are unsightly, they can be difficult to mow around in a lawn and can also attract fungus and other wood rotting organisms which can affect other trees. We have three sizes of stump grinder; our compact pedestrian grinder is great for accessing those hard to reach stumps and can gain access to most back gardens, requiring an access width of just thirty inches. 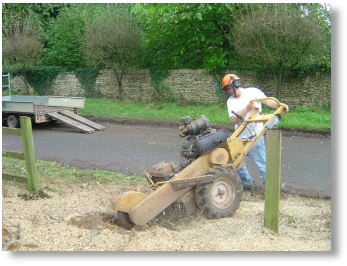 Our mid-sized grinder is a hydraulically powered, four-wheeled, self-propelled unit capable of removing larger garden stumps with the push of a lever, taking all the back ache out of removing those large tree stumps by hand. Our largest stump grinder is tractor mounted. 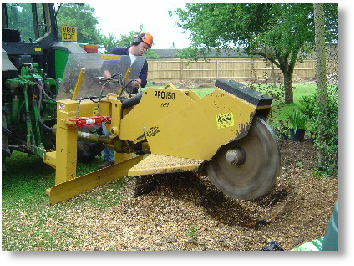 With a cutting depth of 24” (61 cm) below ground using 40 stump cutting teeth on a 30” (76.2cm) diameter wheel and a cutting slew from one position of 78” (2m), it is capable of removing massive stumps in minutes; perfect for site clearance. 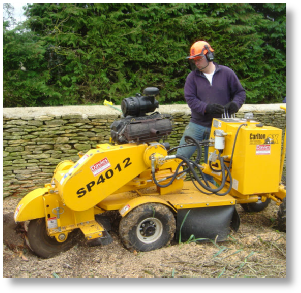 Having three different sizes of stump grinder ensures that we can remove any size of stump in any location, from a single small stump in a hard to reach back garden, to huge mature tree stumps.